Last Thursday, the CHF was the weakest currency on the day. There was chatter of some intervention by the SNB. The price trended to a high of 0.9847. On Friday, the high reached 0.9855. The consolidated with the 200 hour MA trying to hold support. THat MA was broken in the London session. 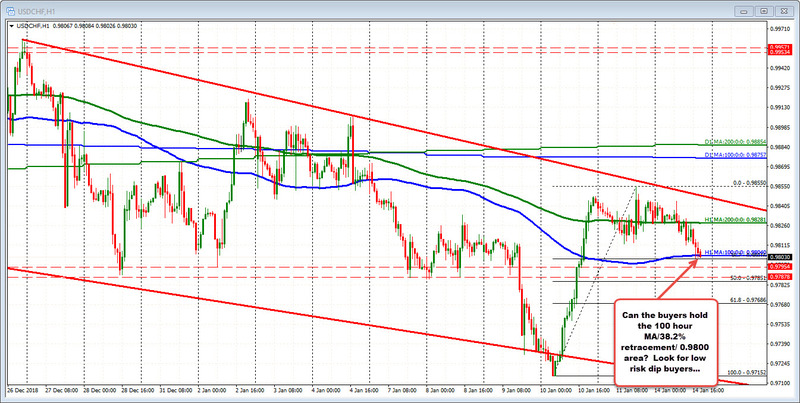 The next stop becomes the 100 hour MA (blue line at 0.9804). That is where the market is testing now. Also near the line is the 38.2% at 0.9802. Do the buyers come in here? Do they buy the dip back to the MA/38.2% retracement. With the 0.9800 natural level not far away, a move below can be a stop for dip buyers.